View of Sheffield from Heely. At the start of the 19th century the town of Sheffield had a single and very large, parish but in 1846 it was divided in to 25 separate parishes, one of which was Heeley. At this time Sheffield was expanding and was becoming an important commercial centre. The steelworks, for which the town would become so well known, were also built in 1846 and steel soon surpassed cutlery as the major industry. 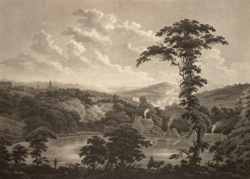 Sheffield is actually situated in a natural amphitheatre of 7 hills and at the confluence of 5 rivers and this print shows some of the beautiful scenery in the area.